The 25-week concert series begins its new season this week with Mike Boulware and his bands, The Mudpies and All My Friends, looking back at the music of Tom Petty and three other greats who died during the past year. Mike Boulware and Tommy Petty both grew up in the 1950s in northeast Gainesville. They first crossed paths playing Tiny Mites football at Northeast Park. They attended Howard Bishop Junior High at the same time and, a few years later, were in Chorus together at Gainesville High School. Boulware, however, doesn’t want to give anyone the wrong impression. When Petty, the Rock & Roll Hall of Famer, died of cardiac arrest last October, Boulware was as stunned as anybody else. But because of Petty’s ties to Gainesville, Boulware felt compelled to honor his music in their shared hometown. 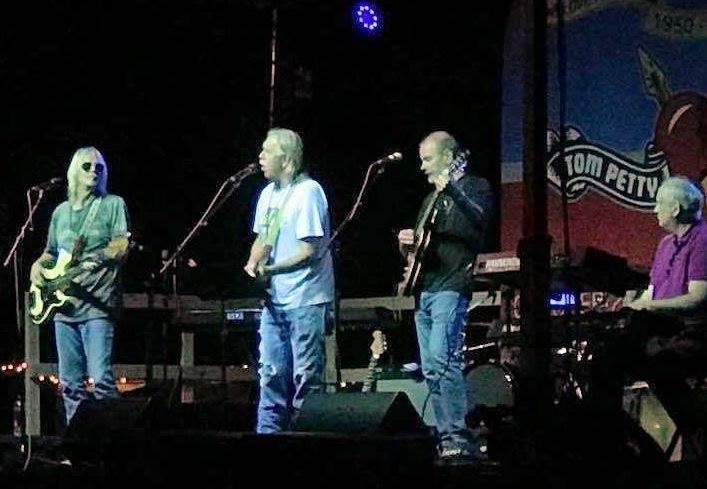 On Friday night, Boulware and his Tom Petty cover band, The Mudpies, will play an entire set of Petty tunes during a concert event called Sing Me Back Home: In Memoriam to the Music of Tom Petty, Glen Campbell, Merle Haggard and Gregg Allman. The inaugural Free Fridays Concert Series event of year takes place from 8-10 p.m. at Bo Diddley Plaza. 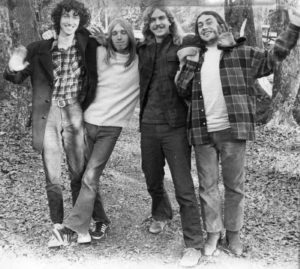 Tom Petty (second from left) and other members of Mudcrutch in the early 1970s. “It’s a great mix of musical styles and it should be an interesting concert,” said David Ballard, who organizes the Free Fridays series for the City of Gainesville Department of Parks, Recreation and Cultural Affairs. Boulware will be joined onstage by Don David (guitar/vocals), Thom Duncan (bass/vocals), Tom Holtz (guitar/vocals), Jimmy Millsaps (drums/vocals), Jon Alexander (pedal steel) and Brad Bangstad (keyboard). Collectively, Boulware refers to the band as All My Friends, but most of them also are members of The Mudpies. The Mudpies will perform songs performed by Mudcrutch, which was Petty’s band before rising to fame with the Heartbreakers in the 1970s. In addition to Petty, Mudcrutch included future Tom Petty & the Heartbreakers members Tom Leadon, Danny Roberts, Mike Campbell and Benmont Tench. The group was the long-time house band at Gainesville’s iconic music venue Dub’s. Boulware was two years younger than Petty. 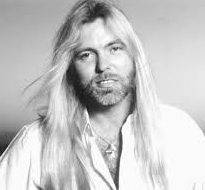 He remembers seeing Petty perform with his very first band, the Sundowners, at the Moose Club on Northeast 23rd Boulevard, just four blocks from Boulware’s house. When Petty started his second band, the Epics, Boulware saw them perform at the Orange Lake Civic Center. “He was always a bass player when he was here — never guitar,” he said. Boulware is hoping that Petty fans enjoy Friday night’s tribute to Gainesville’s late, great native son, but also arrive early for the first set, which will include songs once performed by Merle Haggard, Glen Campbell and Gregg Allman. The Bo Diddley audience can expect Boulware and All My Friends to perform five Allman songs, including “Sweet Melissa” and “My Only True Friend,” which is the first track on Southern Blood, the singer/songwriter’s final studio album released posthumously last September. 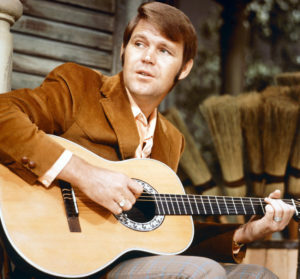 The early set will also feature the Merle Haggard hits “Mama Tried,” “Silver Wings” and “The Running Kind.” The tribute to Glen Campbell will feature “By the Time I Get to Phoenix” and “Wichita Line Man,” both written by Jimmy Webb. Boulware never met Campbell, but he did get to meet Allman several times. 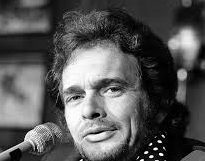 He met Haggard when the country music legend performed at the O’Connell Center many years ago along with Conway Twitty and George Jones. “He signed my ’56 Fender Telecaster,” Boulware said. Ballard, the Free Fridays Concert Series coordinator, said almost every featured band this year is based in Gainesville. This year’s six-month Free Fridays program includes classic rock, blues, jazz, soul, reggae, R&B, pop, folk, ska, country, big band, progressive rock and Latin fusion, all culminating in October with the world music extravaganza presented by the UF School of Music ensembles. Other tributes this season will honor Jackson Brown, Santana and Janis Joplin, Buffalo Springfield, The Progressive Rock Experience, Joni Mitchell, Jimi Hendrix and the return of The Relics with a tribute to Woodstock-era music. The Relics’ first Free Fridays appearance in 2009, to mark the 40th anniversary of Woodstock, drew some 3,000 people.